The best way to rejuvenate your kitchen’s décor is with beautiful new granite kitchen countertops. 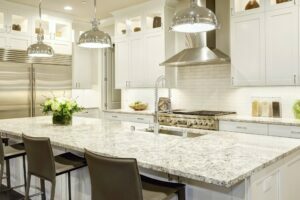 Northstar Granite Tops offers the very best in granite kitchen countertops for Medina and the surrounding areas and are here to help you update and renovate! Granite kitchen countertops are a great choice for any home and with minimal maintenance and care, your granite kitchen countertops will add class to your kitchen for decades. With granite, you get a bold, beautiful look that is also incredibly durable and long-lasting. Granite is one of the hardest materials found in nature, second only to the diamond! And, because granite is so hard, it resists chipping, scratching and discoloration making it perfect for the kitchen. With all of the messes that go along with cooking, granite kitchen countertops make an excellent choice due to the fact that they are stain and bacteria resistant. They are stain and bacteria resistant. You only need warm water and a mild soap to clean your granite kitchen countertops. And, these are just some of the reasons to choose granite kitchen countertops for your home. Granite is the most popular kitchen countertop material in the market and every day more and more homeowners are catching on to how wonderful they can be. Let’s get started selecting and installing your granite kitchen countertops! Give us a call today so we can get to work. Granite countertops are what we do; it’s in our name! Northstar Granite Tops has been the trusted name in granite kitchen countertops since 2002, and with good reason! Our customers know they can rely on us for excellent value and expert craftsmanship. We are here to help you every step of the way. Our process begins when we meet with you to discuss your ideas for your new countertops, assess your needs and see what you have in mind for the look of your kitchen. From there, we calculate a written estimate and begin the granite selection process. We’ll have you come out to our showroom and see our incredible selection of granite in person. Then we begin the fabrication and installation process. We customize the perfect granite kitchen countertops for you and come out to your home and install them. Then, simply sit back, relax and enjoy your new, beautiful granite kitchen countertops! Call the experts at Northstar Granite Tops today and we will help you get your remodeling project underway. Would you like to learn more about granite kitchen countertops for your Medina home? Call Northstar Granite at 320-963-8677 or you can contact us to get a Free Estimate.